Announcement From now until the end of December, I am running a special in my shop. Buy 3 or more patterns and get 10% off, just enter the code 10PERCENT when you checkout and etsy will take care of the rest for you. 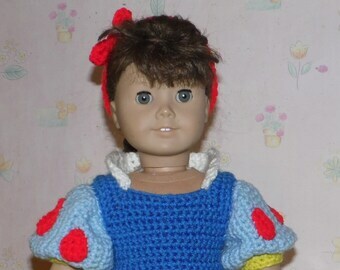 I specialize in creating crochet patterns for 6 inch and smaller dolls. I have recently started working with the 18 inch American Girl dolls as well. If you have a doll in mind that I don't currently have a pattern for, email me and I will see what I can do. From now until the end of December, I am running a special in my shop. Buy 3 or more patterns and get 10% off, just enter the code 10PERCENT when you checkout and etsy will take care of the rest for you. I like the construction but the size is off by a lot for adult faces. Download was great and quick. Easy patter, except it is not clear on how to join each row. Very confusing. I do not mind anyone selling their completed project from my patterns. However, they are copyright protected. They may not be resold in part, as a whole or by adding to or modifying them. With your purchase you are agreeing to these terms. I am in no way affiliated with Mattel, Inc. or any other doll company. The dolls I use are just my models. Buyer should contact me within 3 days of auction end with payment information. Payment is due within 10 days, unless other arrangements are made before the end of the auction. Please do not bid if you do not intend to pay. I am charged fees for each listing regardless of whether or not it sells. If at anytime you are not happy with a completed item, I will accept a refund if the item is returned to me in resalable condition within 7 working days from the date you receive it. I do provide tracking numbers, so I will know when it was received. This is covered under the shipping charges. Due to their nature, downloaded or emailed items are not available for refund or exchange. I prefer paypal, direct checkout or money orders, but will also accept cashier's checks. No personal checks please. International bidders paypal or direct checkout. Buyer pays all shipping costs for completed items as outlined on the listing page. If paying by PayPal, make sure to adjust the shipping charge to reflect the proper amount before submitting payment. If the shipping charge isn't correct, I will have to refund payment and request the proper amount. All patterns are available for immediate download as soon as payment clears. I can also email them or print them and send them by USPS (additional charges will apply) if you prefer. Emailed patterns are now available in the body of the email or PDF form. Please let me know which you prefer when making payment. PDF form requires Adobe Acrobat Reader. I do make custom orders. If you would like for me to make an outfit from any of the patterns I currently have listed, please email me. If you have an outfit in mind that you would like that I don't currently have a pattern for, email me and I will see what I can do. 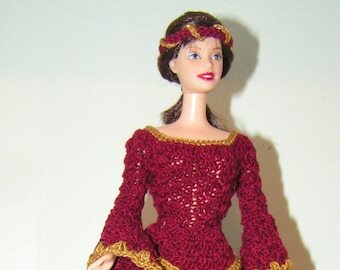 I also take requests for patterns if I have the doll on hand. for the majority of my thread items, I used a size 7 (1.5 mm) hook. for the majority of my items made from worsted yarn, I used a G/6 (4.0 mm) hook. I do have this information in each pattern as well. for the 18 inch dolls, I generally used worsted yarn. Red Heart is my go to since my nearest yarn store carries it the most. For any outfit that requires thread (8 inch dolls or smaller), I used size 10 cotton thread or the equivalent. Some of my patterns call for OmegaCrys thread, which is a size 10 that has the look and feel of yarn.